Place Mexican rolls, cut side up, on a baking tray. Heat the butter and olive oil in a large frying pan over medium-high heat until the butter melts completely. Sauté onion for 2-3 minutes or until it turns translucent. Add garlic and sauté for 30 seconds. Add shrimp and cook until they turn pink. Season shrimp with parsley; remove from heat. Divide shrimp among 6 Mexican rolls and cover each roll with the butter sauce. Sprinkle with grated cheese. Bake for 8-10 minutes or until rolls are lightly golden. Remove from oven. Garnish with pico de gallo sauce just before serving. Enjoy! One of my favorite recipes is shrimp in a butter sauce. The combination of shrimp with that delicious butter, parsley, onion and garlic sauce, is simply irresistible. 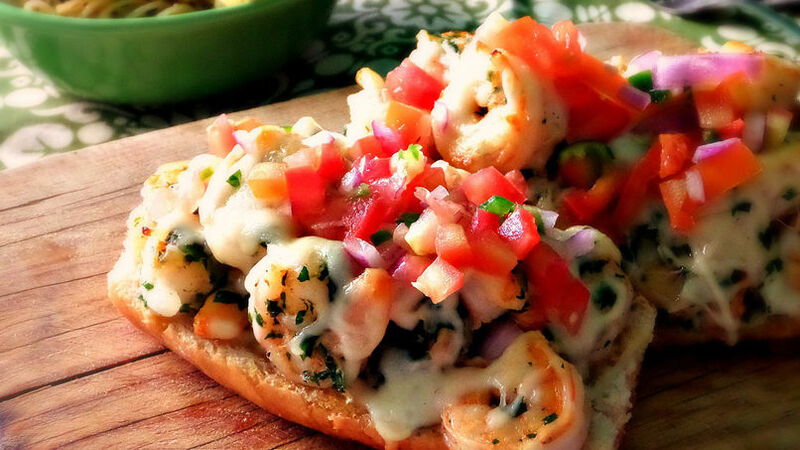 Serve the shrimp molletes with pico de gallo sauce for a light lunch or with a salad for a light and quick dinner.